SoleHeeled offers convenient and affordable 3.1 Phillip Lim handbag repairs by Australia’s best craftsmen, with free shipping to your door. 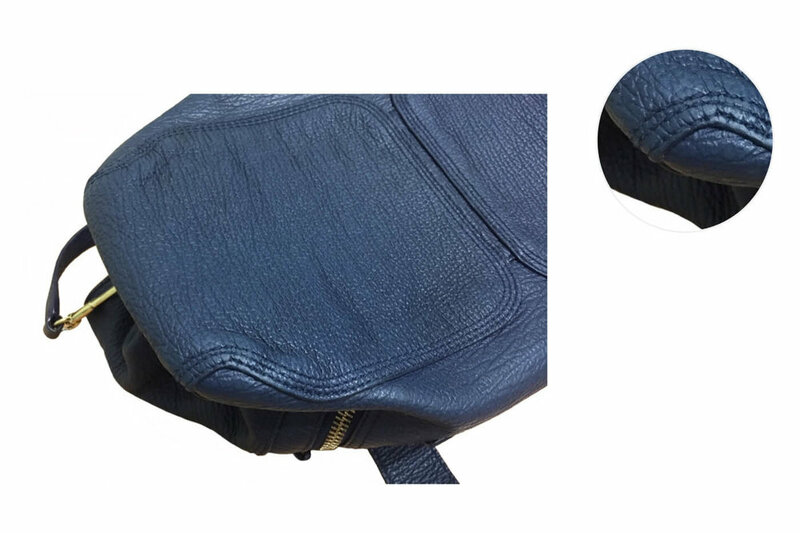 This case study outlines how we recently restored a customer’s 3.1 Phillip Lim handbag. The 3.1 Phillip Lim Pashli Satchel is a signature piece of this New York City-based luxury fashion house, combining edgy aesthetics with everyday functionality. However, over time, the bottom and bottom corners of this bag bore the brunt of daily use — the colour had worn away leaving the leather looking old and discoloured. When this customer reached out to us for a free diagnosis/quote, we offered to clean and condition the leather and then re-dye those parts of the bag affected by the loss of colour. Before any leather recolouring, the leather was first thoroughly cleaned and then conditioned to ensure it was fresh, supple and ready to fully absorb the new colour. We then custom mixed a leather dye to match the existing colour of the bag and applied it to the discoloured parts of the bag with a thin brush followed by a polish — for a perfect finish. Have a 3.1 Phillip Lim handbag needing repair or restoration? Our experienced craftsmen have been trusted by not only generations of Australians but also local and international brands (including Versace and Canali) with the repair and restoration of luxury designer handbags since 1955. If you have a beloved 3.1 Phillip Lim handbag in need of repair or restoration, ask us for a free diagnosis/quote by completing our online order form — where you can upload photos of the bag and let us know exactly what you would like done to it, or let us advise you on what the bag needs based on the photos. Send your handbag: Drop your handbag off at a local post office for free packaging and shipping to us. We repair: A team of experienced craftsmen will carefully repair your handbag. We return: We'll deliver your repaired handbag to you, wherever you are in Australia. This leather on this Chanel handbag was heavily stained and discoloured, to the point where the bag would need to be recoloured. We performed a full colour change, to a dark grey that concealed the stains and got the bag looking effectively new. The leather on this Valentino Garavani Rockstud tote bag had become dirty, dry and scuffed, leaving the leather darker and in desperate need of restoration. We cleaned and conditioned the leather before performing a full colour restoration. The vachetta leather handles and trim on this Louis Vuitton bag had been painted over with a substance that was not absorbed by the leather and was starting to fade and peel away. We fully stripped the leather of this substance, cleaned and conditioned the bag and then recoloured the leather.